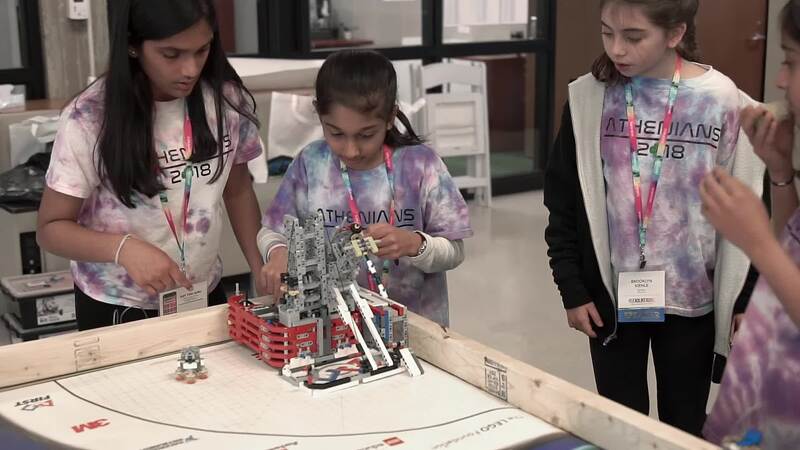 To the nearly 2,000 girls in K-12, parents, educators, mentors and sponsors who came together for two days of empowering and inspiring girls in STEM, entrepreneurism and leadership. To all of the participants and the winners of the STEM Talks and Business Fair who were awarded cash prizes totaling $10,000! Anna Du is twelve years old and is a middle school student attending the Andover School of Montessori in Andover, MA. She's a big fan of both science and engineering and has attended STEM education camps every summer as well as attending engineering workshops at MIT since she was five. Originally from Florida, she moved to Massachusetts at a young age; through her explorations of the beaches in Miami and Boston she developed a strong appreciation for the ocean and marine life. Throughout the past several years, her work as a young scientist has focused on the globally increasing, widespread problem of plastic pollution - specifically microplastic pollution. She has invented an underwater ROV (remotely operated vehicle) which uses infrared and other wavelengths of light, combined with artificial intelligence to identify and spatially map regions of microplastic accumulation. She has been named one of the top ten students in the US, by 3M’s America’s Young Scientist Challenge, as well as being selected as one of the top 30 science fair students in the nation (from a pool of 80,000 students) by the Broadcom Masters Program, administered by SSP - the same organization that operates ISEF and formerly, the Westinghouse Science Talent Search. Her work and accolades have been featured by Discovery Education, FOX-TV 25 News, Fast Company, Smithsonian Magazine, and she is currently filming a special for WGBH’s Design Squad. News about her achievements have been translated into over 20 languages. Her work has been recognized by top international environmental organizations, and she has recently been awarded a $10,000 award to further her work in oceanographic engineering. Anna is currently collaborating with a number of researchers in this field and is planning major additional upcoming enhancements to her patent-pending system. Her hobbies include ice skating, gardening, violin, and reading — especially books about science. She hopes to one day attend MIT and become a Woods Hole oceanographer. Reshma Saujani is the founder and CEO of Girls Who Code, the national non-profit organization working to close the gender gap in technology and change the image of what a programmer looks like and does. The organization has already reached 90,000 girls in all 50 states. She is the author of three books, including the newly released Brave, Not Perfect, Women Who Don't Wait In Line and the New York Times Bestseller Girls Who Code: Learn to Code and Change the World. Reshma’s TED talk, “Teach girls, bravery not perfection,” has more than four million views and has sparked a national conversation about how we’re raising our girls. In 2010, Reshma surged onto the political scene as the first Indian American woman to run for U.S. Congress. She has also served as Deputy Public Advocate for New York City and ran a spirited campaign for Public Advocate in 2013. Reshma lives in New York City with her husband, Nihal, their son, Shaan, and their bulldog, Stanley. In her lofty career as an aerospace engineer and instrument manager at NASA’s prestigious Goddard Space Flight Center, Aprille Joy Ericsson has played a key role in designing spacecraft and instruments that contribute to our greater understanding of the Sun-Earth connection, space science and Earth itself. Aprille, who currently serves as the Goddard Space Flight Center’s Program Manager for Small Business Innovative Research and Small Business Technology Transfer Research, is equally known today for her work to motivate other minority students in science and engineering. The majority of her engineering career has been spent working at the NASA Goddard Space Flight Center where she began as an aerospace engineer in the Robotics group, but soon after, she transferred into the area of Guidance Navigation & Control. There, she worked on key satellite design projects which were invaluable in predetermining the dynamics and structural reactions of these spacecraft. She would go on to spearhead, or play an important role in, other multi-million dollar space initiatives such as NASA’s Tropical Rain Measuring Mission which helped observe the effects of weather cycles known as El Niño and La Niña in order to correlate their activity with crop productivity. For her work and achievements, she has received numerous honors, including: Howard University’s College of Engineering, Architecture, & Computer Science Alumni Excellence Award; NASA’s Exceptional Achievement in Outreach Award, and the President’s Medal from York College. Be prepared to be wowed! STEM Talks will be given by young women in high school on original scientific work or research from the past year. Each talk will be 5-8 minutes in length. $5,000 in cash prizes will be awarded to the top four STEM Talks! What Do Animals Bring to the Classroom? The #LEADLIKEAGIRL Business Fair is an opportunity for high school girls to showcase their entrepreneurial spirit, creativity, and business acumen through a business plan of their own design. Students will present their developed good or service to a panel of entrepreneurs, venture capitalists, and a participating audience, in a competition for three cash prizes, awarded to the business plans that are deemed most innovative and profitable. Students will have the opportunity to showcase their business plans at the Business Fair and Expo alongside experienced women who already own and operate their own businesses. $5,000 in cash prizes will be awarded to the top four business plans! Learn more about the Business Fair. Sponsor the Conference in 2020! We want the #LEADLIKEAGIRL conference to be spectacular—and you can help! Please consider becoming a changemaker by sponsoring the conference today. Sign up to be one of the first to know when registration opens. Special thanks to The Harris B. Siegel Fund and our sponsors.